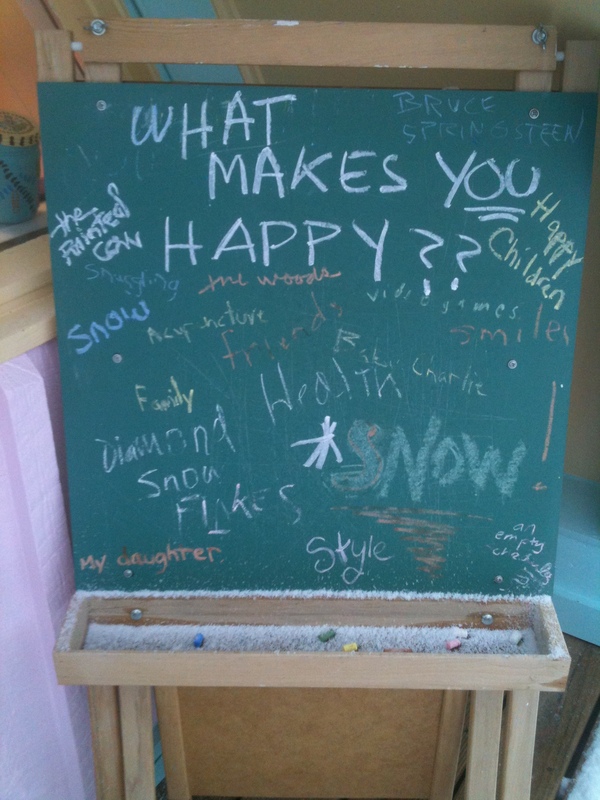 That question was written on a chalkboard I kept near the entrance to The Happiness Paradigm in Maple Corner. Everyone was invited to pick up a piece of chalk and write their own answer or answers to that question. I ask this same question at the beginning of many workshops. Internet visitors are also welcome to email your answers to the question (happinessparadim@mail.com) or add a comment below. I periodically update this pae. My dog … a oood fruit platter … cleaning while listenin to classical music … my kids … conquering the weeds … gardening … reading … watching my mom laugh … relationships …. summiting a mountain … dancing … my girlfriend … jigsaw puzzles …. swimming in Vermont ponds … a warm Florida sunset with wine … a notebook and pen to write … cooking … outdoor activities … a mild day in the midst of cold weather … singing and dancing … playing with my granddaughter. Liam … Today … Music … Love … Sunshine … This day … Skiing … Snowboarding … Compassion … Learning to swim …Being alive … Appreciation …My kitty … Crafting … Food … Hidden humor … Earl Grey tea … Riding my bike … Colorful autumn sky and bright yellow leaves … Singing … Writing … Grandchildren … Yellow pale peach tip … Waterfalls … When I’ve done something good … Love … Gardening … Friends … My husband … Playing with kids … The Buddhist Peace Fellowship. wow thats a nice way of finding happiness in different individual.I liked it!we all have different idea of what happiness is.there are many factors to acquire happiness but if we sum them up.Happiness is all about keeping our physical,mental,emotional and spiritual balance and well beings. Long ago, there was a man who makes his living by catching the fish from the pond. the pond was full of fish. He was always lying near by pond pond and catches only the required number of fish for his daily consumption. one fine day one of his friend came near by him. “What are you doing here” he asked. “i am sleeping” a man answered. “Catch the fish as much as you can” he suggested. “Why i have to catch many fish?” a man asked. “Because you can sell and earn a lot of money” he said. “you will become rich and live peacefully” he said. “you are sleeping!!! !” He exclaimed. “That is what I am enjoying peacefulness” a man said. His friend left with speechless after hearing this. No worry, No tense and No desire……. makes people happy! This is a simple illustration of Gross National Happiness concept.